3 easy steps to use ? pull on, tear off the sides, roll to dispose. Pants crafted with a soft & stretchy belt and leg cuffs that adapt to baby?s movements for a gentle fit. Feather-like soft materials for Pampers? gentlest touch on skin. Designed to allow air to flow freely inside the nappy pant for breathable dryness. Absorbent Micro Pearls absorb and lock away wetness for up to 12 hours of dryness. Want to know more about the components Pampers uses? 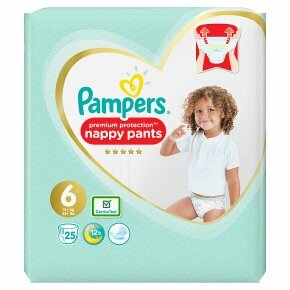 Visit pampers.co.uk, pampers.ie. Say goodbye to fussy nappy changes with Pampers Premium Protection Nappy Pants. Featuring a soft and stretchy belt, and all-round 360? Fit they go on with just one pull, even when your baby is wriggling around. They?re crafted with feather-like soft materials to provide Pampers? gentlest touch on skin. Plus breathable materials keep your baby comfortable for up to 12 hours of Pampers trusted dryness. So now nothing will get in the way of your baby?s playtime. Use with Pampers wipes. Packaging may vary.